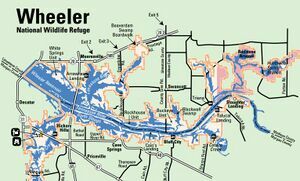 Wheeler National Wildlife Refuge is a National Wildlife Refuge located along the Tennessee River near Decatur, Alabama. Named after Major General Joseph Wheeler, it was established to provide a habitat for wintering and migrating birds in Northern Alabama. This 35,000 acre wilderness area was set aside by President Roosevelt in 1938 as home to 295 species of bird, 115 species of fish, 74 species of reptiles and amphibians, 47 species of mammals, 38 species of freshwater mussels, and 26 species of freshwater snails. Other animals such as the endangered Gray bat and benefit from the protection of the National Wildlife Refuge System, and the care of dedicated refuge staff and other friends of wildlife. Wheeler provides for a wide spectrum of wildlife. Its great diversity of habitat includes deep river channels, tributary creeks, tupelo swamps, open backwater embayments, bottomland hardwoods, pine uplands, and agricultural fields. Visitors can participate in many activities at the Visitors Center near Decatur AL. Wheeler NWR offers five hiking trails ranging in length from 200 yards (180 m) to four miles (6 km), providing opportunities to view wildlife in a wide variety of habitats. Additionally, six improved boat launch areas provide access to the Tennessee River. The Atkeson Trail - located just behind the Visitor Center. The Trail has a boardwalk crossing over a cypress swamp, then continuing through a wooded area. Flint Creek Trail located on the north side of Highway 67, approximately 200 yards west of the Visitor Center entrance and connects to a fishing pier. Chipmunks, squirrels, woodpeckers, wrens, and northern cardinals are commonly seen. Dancy Bottom Trail - located in bottomland hardwoods near Flint Creek, this 2.5 mile round trip trail offers a wide variety of scenery. Deer, squirrels, rabbits, woodpeckers, and many other species of wildlife are often encountered along this trail. Beaverdam Swamp Boardwalk - (trailhead near exit 5 on I-565) this very scenic 1 mile trail crosses a swamp filled with some of the state’s largest water tupelo trees. Various species of songbirds, frogs, turtles, small fish, snakes, and other reptiles and amphibians are often visible along the trail. Wildlife Observation Trail - located directly behind the Visitor Center. 200 yard trail, overlooks a waterfowl/wildlife display pool. During winter, thousands of ducks,geese and sandhill cranes can be viewed comfortably from the Observation Building. Fishing is very popular at Wheeler NWR with an estimated 200,000 annual visitors. The Tennessee River provides excellent fishing opportunities for bass, sunfish, crappie, sauger, and catfish. Public hunting is permitted on approximately 18,000 acres (73 km2). 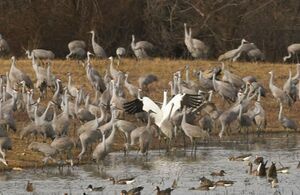 Visitors flock to Wheeler National Wildlife Refuge for Festival of the Cranes every winter. The main visitor center provides an overlook of a waterfowl impoundment for birdwatching as well as the opportunity to see a red-tailed hawk. Several other spotting scope stations are set up throughout the refuge. Additionally, the "Wildlife Observation Tower" is located on the north side of the Refuge and provides an elevated view of the Beaverdam peninsula, an area of the Refuge managed primarily for Canada geese. Wheeler NWR has eight sites on North Alabama Birding Trail, which is most sites on the trail within any public land area. Point Mallard Park Campground - 233 Trailer/RV campsites with facilities plus 6 primitive campsites. 25 wooded-acres on the edge of the Tennessee River. Open year-round. The campground offers free wi-fi, a laundry facility, dump station, a grocery store, three covered pavilions with restrooms & showers, an enclosed meeting facility, kids playground, and grills. The campground is walking distance to the Golf Course, soccer fields, tennis courts, Water Park, and the Ice Complex. March: Federal Junior Duck Stamp Contest. May: Youth Fishing Rodeo, FAWN Festival. August: United Way’s Day of Caring Fishing Rodeo. Located along the Tennessee River, the refuge provides a mix of bottomland hardwoods, mixed hardwood and pine uplands, shallow water embayments, and agricultural fields. Of the Refuge's 35,000 acres (142 km2), there are 19,000 acres (77 km2) of land and 16,000 acres (65 km2) of water. The area consists of some 10,000 acres (40 km2) of forested wetlands and upland hardwoods, with main species consisting of red and white oaks, hickories, poplar, ash, and tupelo; 3,000 acres (12 km2) of pine plantations, much of this subjected to sanitation cuts in the mid-1990s due to Ips beetle and pine beetle infestations; and 4,000 to 5,000 acres (16 to 20 km2) of farmland, with the remainder including open shelves, rocket test ranges, and other areas. This mix of habitat provides for a wealth of wildlife diversity on the refuge. Wheeler NWR has supported up to 60,000 geese and 100,000 ducks, although recently these levels have declined to approximately 30,000 geese and 60,000 ducks. Since 1990, winter goose populations have dropped significantly due to many different factors; below 15,000 from 1990–1995 and about 2,500-5,500 in the last few years. Snow geese are now the most prominent component of the winter goose population, peaking near 1,500-3,200 in recent years. In addition to migratory birds, the refuge hosts 115 species of fish, 74 species of reptiles and amphibians, 47 species of mammals, and 288 different species of songbirds. Some common mammals include squirrels, raccoons, opossums, rabbits, quail, and deer. Approximately ten endangered species which live on the refuge. There is also a small population of American alligators present within the reserve; they were reintroduced into the area following historical extirpation from northern Alabama. This page was last edited on 13 January 2018, at 20:33.